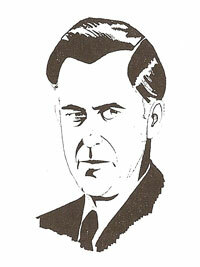 If one man could be credited with launching the 20th Century revolution in agriculture, it would be Henry Agard Wallace. ■ Though a controversial political figure, Wallace is highly esteemed by the agricultural community for his pioneering in agricultural science and the genetic improvement of corn. ■ As editor of Wallaces Farmer (1929-33), he was a vigorous champion of agricultural reform and the powerful promoter of hybrid corn which would triple and quadruple corn production. No single development contributed so much to the improvement of American living standards. ■ Henry A. Wallace was born on an Iowa farm October 7, 1888. He came from a long line of farmers, college professors, editors, politicians, and Presbyterian ministers reaching back to the Kilmarnock area of Scotland. His father, Henry C. Wallace, served as Secretary of Agriculture. ■ Wallace had an intense interest in corn, America's basic foodstuff. His experiments in corn breeding continued through college. His corn won a Gold Medal in 1924, the year he sold his first hybrid seed corn to farmers. Two years later, he and two associates founded the first company, now Pioneer Hi-Bred International Inc., to develop and produce hybrid seed corn. ■ The popularity of Wallace and his corn grew. But the Depression caused great distress among farmers. In 1933, he was called by President Roosevelt to Washington to serve as Secretary of Agriculture with the nation in crisis. Wallace's aggressive innovation in farm policy was controversial. He became successively Vice President and Secretary of Commerce. ■ He clashed with President Truman over foreign policy and resigned from his cabinet. He retired quietly to his farm in New York to continue his research. He died November 18, 1965.